BUT ARE WORRIED THAT YOUR WRITTEN ENGLISH WILL LET YOU DOWN?" LISTEN, I know where you’re coming from! At school I specialized in science. I was always interested in writing, but given a choice between churning out essays on Shakespeare or performing exciting practical experiments in the school’s space-age science lab, I’m afraid the test tubes won every time! But when I left school and realized I wanted to be a writer, I knew I’d have to polish up my English. So I begged, borrowed or bought every guide to writing I could lay my hands on, and spent many hours alone in my room studying them. And even though nowadays I’m a successful freelance writer and editor, I’m still fascinated by English. I love nothing more than explaining in simple terms the intricacies of grammar, punctuation and style to aspiring writers. ...And that’s EXACTLY what I’ve done in my brand new manual ESSENTIAL ENGLISH FOR AUTHORS! My name is Nick Daws, and I’m a professional freelance writer living in the UK. I’ve written over 70 books, and innumerable published articles, short stories and so on. I’m the author of “Write Any Book in Under 28 Days” and “Quick Cash Writing”, both published by the WCCL Network. I get lots of feedback from buyers of my courses, but one thing has become clear. There are many folk out there who have stories they desperately want to tell, factual books they really want to write. But they never do so, because they are worried that their written English simply isn’t good enough. So, for all these people, I decided to create a concise, easy-to-read guidebook designed to help any aspiring author beat that barrier and take the first step to becoming a published writer. And THAT’S how "Essential English for Authors" was born! As an editor and writing teacher myself, as well as a professional author, I know very well those areas where people are most likely to slip up. I hope that will give you at least an idea of the must-know info you’ll find in Essential English for Authors, all set out in a concise, easy-to-read style. Many new writers are hopeless at punctuating and setting out dialog – but if you’re going to write fiction in particular, you must be able to do this. Find out everything you need to know in this module. In this module I’ve set out all the main punctuation marks and explained their correct use, along with mistakes that are commonly made. From colons to dashes, commas to exclamation points, it’s all set out here for you, with plenty of examples to illustrate correct (and incorrect) use. Many new writers agonize over whether they should use initial capitals for some words or not. Worry no more! This module sets out all the main rules, and ensures you should always know whether to use an initial capital. This module covers the key topic of how you combine words and punctuation into sentences and paragraphs. It explains what makes a “grammatical sentence”, and reveals the exact function performed by paragraphs. Essential reading! This is another common problem area for new writers. Agreement is one of those technical things that is very easy to get wrong. This module looks at the wide range of situations where agreement can present difficulties, and explains the rules to follow to ensure your writing doesn’t become ungrammatical. Okay, we all know that English isn’t always as logical as we might like where spelling is concerned, but this module sets out a number of rules which can greatly improve your skills in this area. Plus it looks at common spelling mistakes, the use of computer spell-checkers, and the differences between US and UK English. I haven’t stopped at the basics either. In this module I turn my attention to some more “advanced” topics. Don’t worry, none of it is rocket science, neither is it strictly essential if you hope to write for publication. But if you’re aiming to write to the highest professional standard ­– and why shouldn’t you? – the information in this module will put you on course for the top literary awards! For example, I’ve devoted an entire module to useful websites and other resources. These include online dictionaries and style guides, along with my all-time favorite grammar website. Among many other things, this little-known site has over 170 free, online quizzes about grammar and punctuation, together with in-depth articles, Q&A’s, and more. With that barrier overcome, the editor will be able to focus on the content of your work – the ideas you are trying to express, or the story you are seeking to tell. If your writing has the potential to appeal to a wide audience, the editor will be able to see it, and hopefully offer you a publishing contract. It just has to be good enough so that an editor can see beyond any minor mistakes to the quality of ideas within. Remember – ANY reputable publisher will have a team of expert editors and proofreaders he or she can turn to. As long as your basic English is sound – as it will be if you’ve studied my guide carefully – these people will perform the final polish needed to bring your work up to a publishable standard. Neither does it matter if you’re not a native English speaker. Many people for whom English is a second or even third language have successfully written books in English. The huge English-speaking audience world-wide means their books have sold many more copies (and made a lot more money!) than would ever have been the case if the books had been written in their native language. IT DOESN’T MATTER – IF YOU WANT TO WRITE FOR PUBLICATION, YOU CAN! Just following the advice in my manual will ensure that your work meets the minimum standard to ensure it is taken seriously by publishers and editors (actually, if you follow all the advice in it carefully, your work will be far above that minimum standard). Then, if you have a good story to tell, there is every chance that a publisher or editor will want to buy it. & Bring Your Written English to a Publishable Standard?" Well, hold on just one second, because I’m not finished yet! I want you to be absolutely confident that if you buy my manual it WILL help you achieve your writing goals. So in Essential English for Authors I reveal a special website where you can ask any question you wish about grammar, spelling or punctuation and get it answered either by me or one of my colleagues. The chances are any query you have will be answered in the manual anyway – but if by chance it’s not, you can get it answered here free of charge, and normally within 24 hours. If you want to write for publication but are worried your English may let you down, my unique manual is all you need to overcome this barrier and achieve publishing success. "Every great writer has questions about the English language. It's incredibly quirky. This guide from Nick answers EVERYTHING. He provides quick, solid rules that will change your writing - and possibly your life. I've read dozens of similar guidebooks, but nothing comes close to this. Worth fifty times the price. Thanks, Nick!" "Essential English for Authors is a book that delivers exactly what it says in the title. I couldn’t believe the amount of knowledge I picked up in just the first few pages. I’ve been a writer for over 10 years and I thought I knew everything there was to know about writing. But Essential English for Authors has really opened my eyes. I plan to read it many more times because it’s become my Bible for the English language!" "Nick Daws has done it again. This time, a resource that will help new writers get to grips with the complexities of language and learn their craft well. A must for every wannabe writer and working author alike!" "As the owner of the WriteThisMoment job site, I know how important it is to impress editors QUICKLY. In this course, Nick shows you EXACTLY what editors are looking for. He'll open your eyes to errors you don't even realize you're making! Then he'll tell you how to fix them. Brilliant course, Nick!" "English is a quirky language! And sometimes you can write a sentence ten different ways. Get it wrong, and you're never going to get published. Nick's course removes ALL of the confusion. I run a writing consultancy and see these errors all the time. Read this course & find out how to fix 'em!" "Oh my gosh, Nick... I just bought this. I've been looking through it as it prints. This is fantastic. I'm amazed at the number of things I have forgotten. "I rarely endorse products (and you know why), but I am really impressed. I just want to say thank you for the time and effort you put into this. It would have taken me months to compile all of this information." So how much is Essential English for Authors? Well, considering there is nothing like it available elsewhere and it could easily set you on the path to a high-earning career as a freelance writer or author, I could have charged upwards of $100 (that’s still much less than the cost of all the reference books I read when I was starting out). Indeed, that’s what my publishers originally urged me to do when they saw the unique and invaluable information the manual contained. I don’t want to exclude people for whom money is tight, however. I remember how frustrated I felt when I first realized I wanted to be a writer yet didn’t have the basic skills to get my words down on paper. I got there the hard way – and that’s why I was so determined that readers of my manual would NOT need to struggle as I did to get their hands on the basic info required to write to a publishable standard. Writing has been good to me, and I want to share that good fortune with other aspiring writers. That’s why I’ve agreed with my publishers to set the launch price of Essential English for Authors at just $24.95. However, this rock-bottom price WILL go up to a more realistic level after the launch period is over. So I do strongly recommend – if you want a copy of Essential English for Authors, don’t wait too long, or you may have to pay A LOT MORE for it! There it is then – a unique and genuine opportunity for you to grasp now. Spend just $24.95 today and you can receive Essential English for Authors in minutes. You can download it straight to your computer, and be polishing your English skills this very day if you wish. I hope by now I’ve convinced you that with the aid of my manual you really can bring your writing up to a publishable standard, and enjoy all the cash, prestige and personal satisfaction being a published author brings. We accept credit cards, USA/UK checks and telephone orders. Prefer to pay with ? Please click here. Works on Windows & Mac computers. Delivered electronically as a PDF file. Costs $24.95, converted to local currency. Approx. £15.95 or 17.95 Euros. I hope my manual will provide the passport to the better life you have always dreamed of. P.S. Just to emphasize this point again, the current price is a special launch offer that WILL NOT BE REPEATED. If you want to take advantage of this once-in-a-lifetime opportunity, therefore, please do it now, before the price rises to its regular level. P.P.S. Remember – under the terms of my publisher’s unique guarantee, you really have NOTHING TO LOSE by taking up this offer, and potentially a WHOLE NEW LIFE TO GAIN when you become a successful, published author. P.P.S.S. And finally, once you’ve brought your writing up to a publishable standard, do check out my CD course “Write any Book in Under 28 Days”, which will help you turn your idea into a book in double-quick time. Or if you want to start earning as soon as possible. 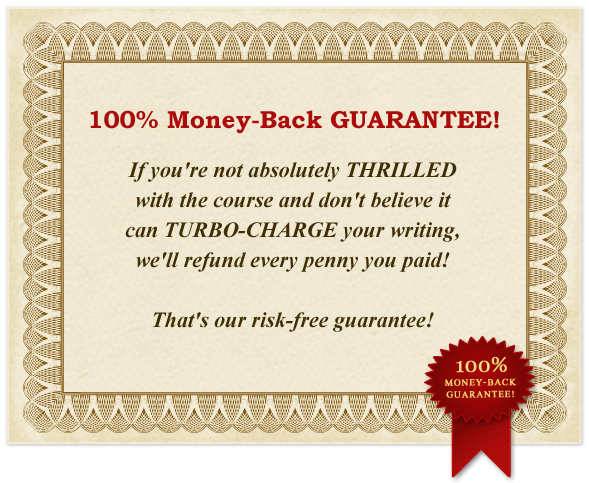 see my course “Quick Cash Writing”. With your new, improved English skills, earning good money from writing really is an achievable goal. LET MY COURSES SPEED YOU ON THE WAY TO SUCCESS!